Gili Lankanfushi: Gili rays- a lot of confusion! Gili rays- a lot of confusion! We're very lucky at Gili Lankanfushi in that we get to see a lot of beautiful ray species around the island. They can be spotted frequently from the pontoon boats or be seen dancing around in the light from our water villas and- if you're really lucky, they will sometimes make an appearance during a snorkel trip too. Can you identify this guy? Perhaps due to their size or their graceful nature, they are always an exciting thing to spot wherever you are. We often get guests visiting us at the desk and telling us about which ones they've sighted that day and we love identifying which species it was from descriptions of colour, shape, behaviour or blurry photos. At a fleeting glance or a flick of a tail they can appear quite similar and we've noticed that there's a lot of confusion surrounding which ray is which. So we've decided to try and clear up the confusion a bit with a brief overview of our rays at Gili! 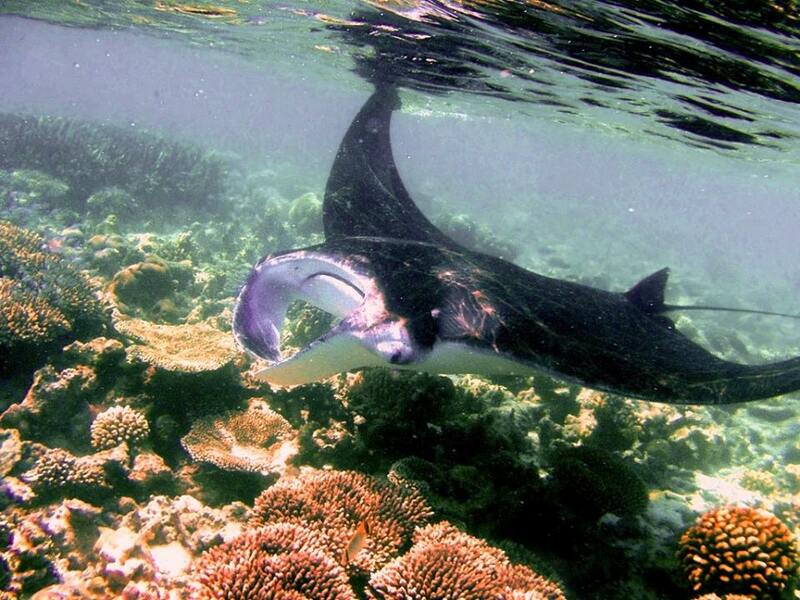 Rays are actually very closely related to sharks and both are what we call 'cartilaginous fish' (yes they are fish!) in the Elasmobranch taxonomic class. These Elasmobranchs are different from most fish you see on the reefs, like the parrotfish, butterflyfish, triggerfish and so on, as these are all 'bony fish' or class Osteichthyes (also sometimes called 'true fish'). 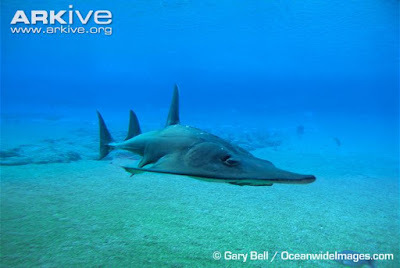 As you can imagine, the main difference between cartilaginous fish and bony fish is the composition of the skeleton but sharks, rays and other members of the cartilaginous fish class also have other unique features such as rigid dorsal fins, special placoid scales and no swim bladder. Stingrays are bottom dwellers and this is an obvious trait that we can use to identify them. They will spend their time on the seabed either feeding, lying stationary to conserve energy or gliding around very close to the sandy bottom. Sometimes they will cover themselves in sand for camouflage, with only their eyes and tail visible. It can be quite alarming when what you thought was a dead palm frond turns out to be the tail of a large stingray! Most stingrays have barbed stingers, usually at the base of their tail, which they will only use for self-defense. Stingrays are not aggressive and do not sting without being provoked. The only time to be wary of stingrays is when entering the water, it’s important to check before jumping in so that you don’t land on one! Eagle rays do not live on the sea bottom but instead will be found swimming or gliding gracefully through the water. They have quite distinctive 'duck-like' snouts at the front of their diamond shaped bodies and can occasionally be seen burrowing their snouts into the sand looking for food. 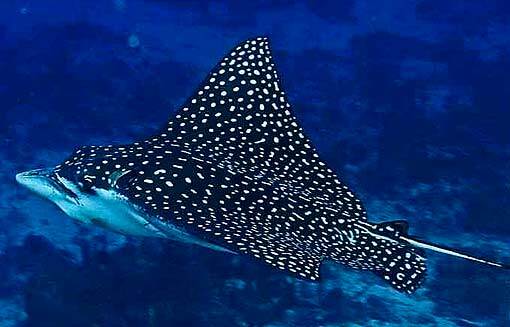 Whereas most of the stingrays are pale and sandy coloured, the eagle rays are much more obvious with their dark blue/black colouring and bright white underside. 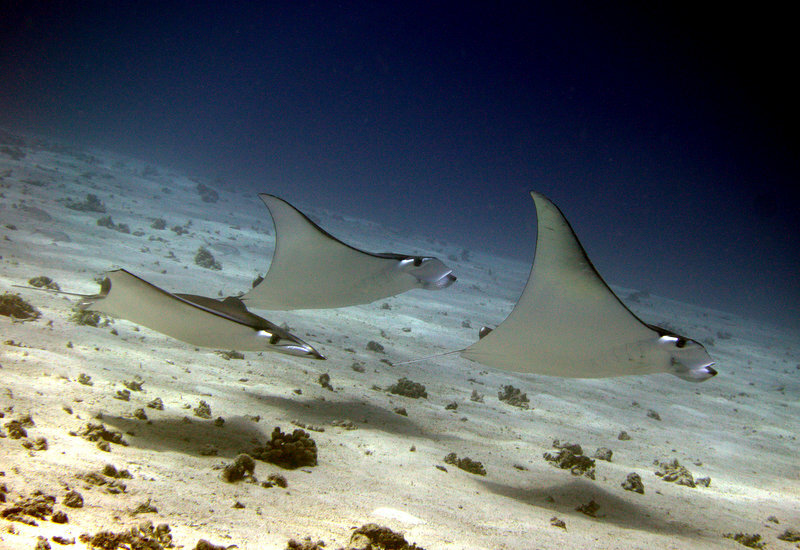 These rays can have very long tails, up to 5 metres, and can swim very rapidly. They do also have barbed tails, however they are much more likely to use their speed to escape and rarely use them. A reef Manta Ray at Vavvaru Island. Manta rays have to be the most popular rays at the dive centre, with lots of guests keen to learn about them or asking where they can go to see them. Manta rays are in the same family as Eagle rays (Myliobatidae) and they too will be seen gliding through the water rather than on the seabed. These rays are much larger in size than stingrays and eagle rays, reaching up to 4.5 metres diameter in the reef manta ray! It is possible to see these majestic rays by snorkeling, but you must be extremely lucky to encounter one, and almost always outside the lagoon, as they are not sighted around the shallow waters of Gili Lankanfushi or near the villas. For the best chance to see them, you have to visit special diving sites by SCUBA. They will often visit specific reefs to be cleaned by small cleaner wrasse or be seen scooping up the plankton soup with their specialized cephalic fins. Certain times of the year yield better chances of seeing them at different sites around the atolls, but for us, between May and October is best. During this period, it is also possible to see the mantas in large numbers at a place called Hanifaru Bay in Baa Atoll, where we have recently started running a trip. Although it's almost 3 hours away, the chance to see 100+ mantas in one aggregation is something that will stay with you for a lifetime. Ask about it next time you visit! Mobula rays are very similar in form to manta rays, they are very closely related, both being in the Mobulidae family. Understandably they are often mistaken for their manta cousins but they are a much smaller species than mantas and also have certain morphological differences. Both manta and mobula rays are filter feeders which sets them apart from the stingrays and eagle rays that feed on small molluscs and crustaceans buried in the sand. They are also completely harmless with no stinging barb at all.These rays can be spotted in the shallow waters around Gili, but they are quite rare! Finally, this strange creature! Is it a shark? Is it a ray? Is it a plane? It is in fact... a ray! Also sometimes called 'shark rays', these guitarfish look like they are half of each, but a few characteristics like their ventrally located mouth and gills, classify them as rays in the Rajiformes order. 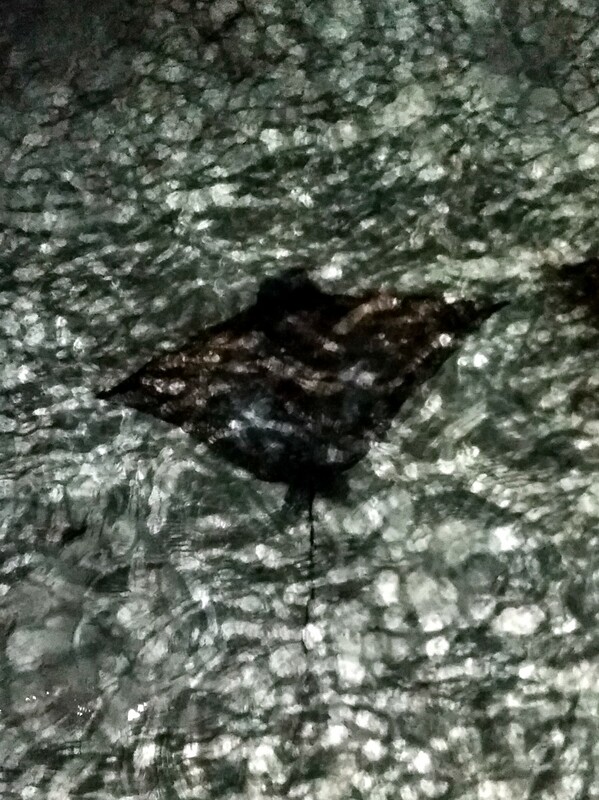 This ray can reach up to 3 metres in length and has on occasion been spotted cruising by guest villas! Hopefully now you can tell your mobulas from your guitarfish and your mantas from your stingrays. Remember to look out for body shape, colouration and general behaviour when you see them- happy spotting!